Eugene and Springfield have more runners than most cities, but we all know the Willamette Valley is terrible for allergies. Must we give up the great outdoors and convince ourselves a treadmill is just as fun? Lacie Glover from US News and Health Report has some tips that can hopefully keep you out and about enjoying whatever exercise inspires you this spring and summer. First, know your allergen tolerance, and what specifically triggers your flare ups. If you can start to notice patterns, you might be able to simply avoid the trails or paths, times of day, weather conditions, or other triggers that push you over your allergen threshold. Second, plan your runs around pollen. Pollen counts are often highest between 5 and 10am, and then again at dusk. Weather is a huge factor in this. For instance, if it rained recently, you may have an amazing run on your lunch break the next day. Third, talk with your doctor about if there are appropriate medications for you. 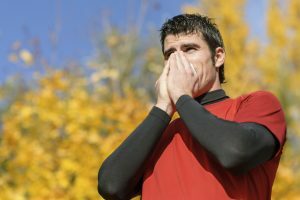 If you do take medication, consider timing your dose for either 2-3 hours before you run if you take an antihistamine, or 15 minutes before you run if you have an asthma inhaler. And just remember you would not be the only person out there wearing a mask if that is necessary to keep pollution and pollen out of your nose and mouth on tough days. Lastly, wash your clothes and take a shower (especially your hair) after every run to get all the pollen off of you. If you’d like to read the article from US News and Health Report, Click Here.